"It's not about the awards. If it's good, I'll do it." Talk about a show hitting you out of left field! The previews for Entourage last summer made it look like a mildly funny tale of a pretty boy up-and-coming Hollywood actor and his freeloading "posse." After watching the first episode I realized that it is a VERY funny tale of a pretty boy up-an-coming Hollywood actor and his freeloading "posse." Blend the sharply written comedy with a group of core characters that are easy to care about, and some inspired casting as far as guest stars go, and you have Entourage, an HBO series that, if there is any justice in the world, will be airing for years to come. Aside from the excellent cast that portrays the four main characters, the best of the bunch is the severely underrated Jeremy Piven. A career character actor, Piven first caught many an eye as a frat-boy in the semi-cult classic, PCU. Appearing in numerous films since, Piven had never really found the one role that could make him a star. Well, his work as sleazy Hollywood agent Ari Gold just might be that role of a lifetime. Having already been nominated for a Golden Globe for his performance, the sky seems to be the limit for Piven in future seasons of Entourage, with a Golden Globe win and maybe even an Emmy nod down the road. Entourage is executive produced by Mark Wahlberg, on whose life the series is loosely based. 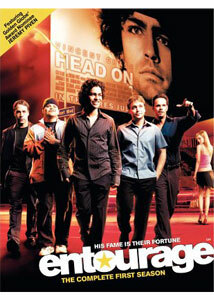 The character of Vincent Chase (Adrian Grenier) is said to emulate Wahlberg in his early acting career. In the show, Chase is always flanked by his manager and friend Eric (Kevin Connolly), his actor/brother Johnny Drama (Kevin Dillon), and his friend Turtle (Jerry Ferrara). The show focuses mainly on Vincent's first starring role in a major motion picture, and all of the women, premieres, and parties that go along with that. However, the character that we wind up caring the most about is Eric, the one seemingly level-headed guy in the bunch who has been unlucky in love and is now pining for Ari Gold's new assistant (Samaire Armstrong). Entourage: The Complete First Season also features some wonderful appearances by numerous guest stars, including Jessica Alba, Scarlett Johansson (who Vincent is trying to "hook up with" in one episode), Lennox Lewis, and Sarah Silverman. However, there are two guest stars who literally steal the episodes they appear in. The first is Gary Busey, who, in Busey and the Beach, is either really a complete nut job, or is really having a blast mocking the way he is perceived by the public these days. The other actor is a bit hard to recognize at first, but, once you hear him channeling Jim Morrison again, among other stoner-types, you'll realize that this, indeed, is Val Kilmer as a drug-addled sherpa in The Script & the Shirpa. A new season of Entourage is just around the corner on HBO, and hopefully it's only the second in a long run. This is yet another in a line of recent success stories for HBO Original Series, and it seems that each effort gets better over time. Unfortunately, the first season of Entourage set the bar pretty high, but as long as Vincent Chase's career continues to evolve, Eric's relationship problems continue, Johnny Drama and Turtle continue to muck things up, and Ari doesn't stop being a jerk, the show will remain a success. Entourage (Pilot): With Vince's first starring role in a major action film about to debut, his agent, Ari, is annoyed at the increased power that Vince has given his best friend, Eric, who is his manager. The Review: Vince and the boys are disappointed with the poor review that Variety gave his film, "Head On". Ari steps in to give Eric advice on how to handle the negativity of the review. Talk Show: Vince agrees to appear on Jimmy Kimmel Live, not knowing that Johnny Drama has a history with Mr. Kimmel, or that one of Vince's ex-girlfriends, Sara Foster, is supposed to be on the same show. Date Night: Eric takes Ari's assistant along with the boys on a night of celebration for the opening of "Head On." This winds up being a real test of their blossoming relationship, as some of the girls that the rest of the boys bring along are real pieces of work. The Script & the Sherpa: Vince's new girlfriend is Fiona, a vegan who is having trouble getting along with the rest of his crew. The visit to a sherpa friend opens their eyes to the benefits that knowing Fiona brings to the table. Busey and the Beach: Vince and his crew are at an art opening when Turtle accidentally breaks one of Gary Busey's sculptures. Ari comes to the rescue to not only appeal to Busey, but to keep Vince from switching agents. The Scene: Pre-production has begun on Vince's indie project, "Queens Boulevard", but Eric doesn't like the film's director, despite Vince's wishes. New York: The crew is off to New York, but Vince has a plethora of women to "say goodbye" to first. Image Transfer Review: The video quality of Entourage has made a very successful jump from TV to DVD, looking the same, if not slightly better than they did when originally broadcast. These full-frame presentations feature very sharp, detailed images, with a bright, vivid color scheme. Contrast and shadow levels are handled almost perfectly, and there's not a bit of grain, dirt, or other blemishes to cause any problems. Audio Transfer Review: The Dolby Digital 2.0 audio is also impressive, but feels slightly bland when some of the more raucous songs are featured on the soundtrack. A 5.1 mix could have provided slightly wider dynamic range and more aggressive bass, adding more power to these songs. The dialogue is crisp and always easy to understand, smoothly blending with the rest of the audio. Extras Review: There aren't a ton of extras, but the ones that are here are definitely worthwhile. Audio commentaries by creator/executive producer Doug Ellin and executive producer Larry Charles are available on three episodes. The tracks are scene specific, but the two participants also find time to talk about the series evolution, from conception to the pilot's first airing. The only other extra is a 10-minute featurette that also covers much of what is discussed in the audio commentaries. There are interviews with the cast and crew, as well as on-set footage. HBO Home Video is off to a good start with their seasonal DVD releases of Entourage. This two-disc set has a couple of nice extras, which leaves plenty of room for improvement for future sets of the show.